As some of us very well know, pre-menstrual symptoms can often seem to rule our physical and emotional body as we ebb and flow through our monthly moon cycles. We feel it in our bellies, our breasts, our cravings and hunger levels, mood fluctuations, energy levels and heightened sensitivity, libido, and sleep. Imbalance often presents itself due to a lack or depletion of certain essential nutrients that are necessary to maintain systemic functions — and those cravings serve as a way to indicate that we are in need of more nutrients as we prepare to complete one cycle and embrace a new one. A long-time craving we typically associate with PMS is chocolate — in all forms, of all kinds. When in fact, the magnesium is what our body is craving, which the raw, unrefined, pure cacao varieties are composed of. Society has largely taken the essence of the cacao and combined it with milk fats, sugars, and other processed and refined ingredients that further complicate things, including our hormones. In moderation, small quantities of raw cacao can be deeply beneficial to ensure we’re receiving essential nutrients like magnesium to maintain balance (although, supplementation may be necessary for certain individuals). Allie Hemmings, a New York-based personal chef, has collaborated with us for a series of recipes incorporating ingredients from the Boketto Pantry — you may remember her Hormone Balancing Chaga Bone Broth. She got a hold of Wunder Workshop GOLDEN SHROOMS, a blend that combines reishi, cordyceps, turmeric and cacao and had the incredible idea to infuse it into a special Moon Time Fudge alongside a host of deeply nourishing whole foods and other herbs for a sweetened experience to help satisy cravings while feeling good about what you’re putting into your body — be it pre-menstrual or otherwise! We love her creative approach in incorporating these herbs into every day foods and recipes, and you can expect more to come. 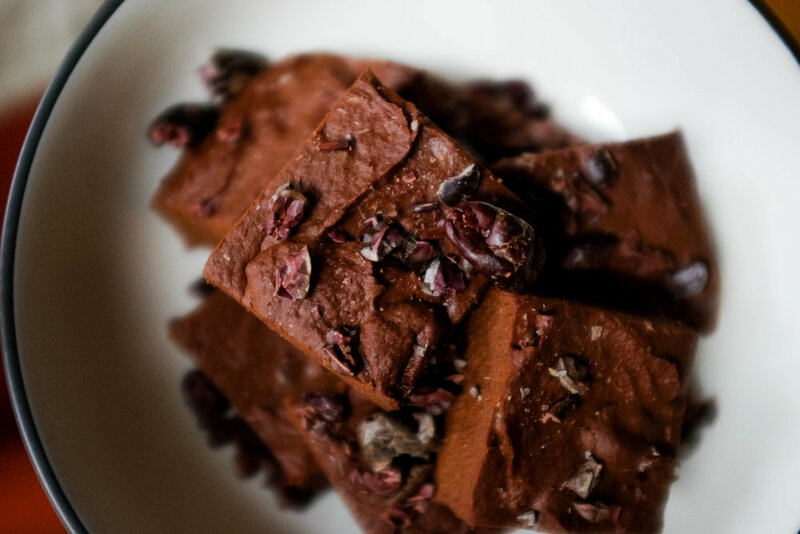 This specific recipe marries together the grounding aspects of sweet potato with the nutrient-rich components of raw cacao and brain nourishing benefits of healthy fats like cacao butter + oil, plus hormone balancing herbs, creating a truly decadent fudge that doesn’t even require time in the oven. It’s nice to prep this Moon Time Fudge in sync with the new and full moon phases so that it’s readily available for those moments when cravings hit and a bit of additional nourishment is needed and desired. As always, make it yours by adding ingredients making swaps based on your taste preferences and dietary needs. Honor your moon time, and nourish her well. Add all ingredients to a blender or food processor and process until completely smooth. Spread into a square pan lined with parchment paper and refrigerate for a few hours or overnight. Remove from pan, slice into squares and enjoy in bliss!